EVENT: Andrew Bukenya presents STRICTLY SOUL mardi gras Special on tonight feat. MK-1 & Beth Yen | SOUL OF SYDNEY FEEL-GOOD FUNK SOUL DISCO vibes & beyond. 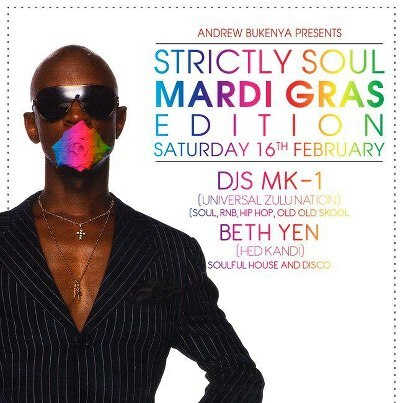 EVENT: Andrew Bukenya presents STRICTLY SOUL mardi gras Special on tonight feat. MK-1 & Beth Yen pushing all kinds of Soul, Funk, Disco & Soulful House Vibes tonight at Oxford Hotel from 9pm. I really like your wordpress design, wherever would you obtain it from? I believe one of your ads triggered my internet browser to resize, you might want to put that on your blacklist. This will be a terrific web site, might you be interested in doing an interview regarding how you designed it? If so e-mail me! the best I have found so far. Just a quick note to let you know that I appreciated your insights about the topic. Quite helpful for what I am interested in these days.